​I met Jean-Baptiste Ponsot (no relation to the Ponsot family in Morey Saint Denis) in 2010 during an investigative trip to the Côte-Chalonaise. Rully is particularly known for its Chardonnay (it is just 5 kilometers (3 miles) south of Chassagne-Montrachet), while both appellations further south, Mercurey and Givry, are known more for their Pinot Noir. The Chateau de Rully is one of the villages focal points, and has been in the same family for six centuries. Rully achieved AOC status in 1939 and, in addition to its white and red wines, is also the most respected village for the production of Crémant de Bourgogne. More than 20 vineyard sites are Premier Cru in Rully, and the finest sites run along the eastern slopes facing the village. This area, known as La Montagne de la Folie, has limestone close to the clay surface, providing excellent drainage and also benefiting from the morning sun. Its similar soils and exposure to much better known areas in the Cote d’Or and its small domaines with a bit of a chip on their shoulders (as they are often treated as Burgundian secondary citizens, has led to excellent wines on the marketplace that almost always display excellent value. ​Jean-Baptiste’s grandfather began growing grapes in 1954, and his son Bernard expanded his vineyard holdings, selling the entirety of his production to Olivier Leflaive. After attending wine school in Beaune (where his roommate was Nicolas Ragot of Givry), the energetic Jean-Baptiste took the reins from his father and began bottling part of the production under his own name. Born in 1980 and at that time 20 years old, it was quite a bold move. 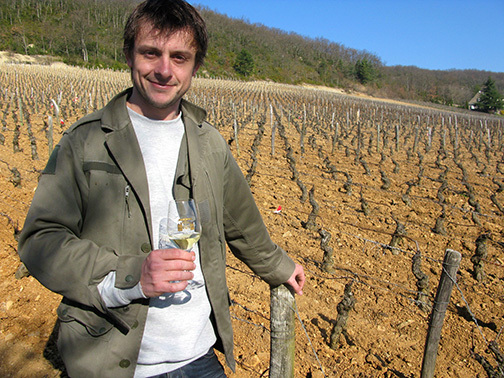 Today the domaine covers 8½ hectares which Jean-Baptiste works sustainably. He plows his vines frequently and attempts to work as close to organically as possible, although he sometimes will spray once or twice a year with a synthetic spray if parts of his vines absolutely need it. He does not use insecticides, herbicides or antifungals. Grapes are harvested by hand and crushed at his winery that stands in the middle of town, where his two barrel rooms are also located. Grapes are harvested by hand and crushed with complete de-stemming. After a cold settling, they go into oak barrels, of which 20-33% re new, depending on the vintage. Blended in August and bottled in November after a very light fining and filtration. Tasting Notes: Cherry and bramble fruit, with notes of vanilla and spice on the nose. Medium to full-body on the palate, with lush texture and long, fine finish. Grapes are harvested with a machine and crushed. After a brief cold-settling, they go into a variety of oak barrels (20-25% new depending upon the harvest) where they ferment. Lees are stirred, and the frequency also depends upon the vintage. 100% Malolactic fermentation. Tasting Notes: The wine is lush and with good acid structure, with a creamy core, tangy citrus and pineapple flavors and well-balanced oak that rides along bright acids on the finish.